Kincho Stadium was built in 1987 to serve as venue for baseball, American football, and lower-level football. 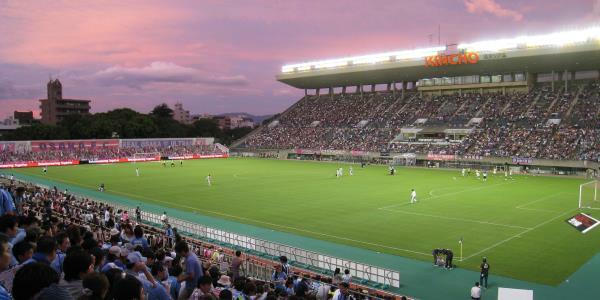 In 2009, Kincho Stadium underwent a major renovation and subsequently Cerezo Osaka made the stadium their regular home. The stadium is currently undergoing further refurbishments. Kincho Stadium is located in Nagai Park in the south of Osaka. It lies right next to the bigger Nagai Stadium. Kincho Stadium is situated about 11 kilometres south of central Osaka and Osaka Station. The stadium is easily reached with the Midosuji Line (M) of the Osaka metro. The Midosuji Line can be boarded at, for example, Umeda Station, which is right next to Osaka Station. The journey takes just over 20 minutes. An alternative is taking a train on the JR Hanwa Line to Tsurugaoka Station, from where it is a short 5-minute walk to the stadium. You can catch a train at Tennōji Station or from a southern destination (for example Kansai Airport). Tickets for Cerezo Osaka matches can be bought online, online through the likes of Pia and Lawson Ticket, in person at the Circle K, Seven Eleven, Lawson, Ministop and Family Mart convenience stores, in person at the Los Lobos club store at the club’s training centre in Nishinari Ward, or at the Kounan Ticket shops at either Osaka or Kyobashi Station. Tickets are generally also available on the gate on the day of the match. Ticket prices typically range in price from Y$ 2,500 for a general admission ticket for the stands behind the goal and part of the western stand to Y$ 5,500 for a reserved seat at the main stand. Cerezo Osaka occasionally play a high-profile match at the adjacent Nagai Stadium.